Architects of the West Kingdom is set at the end of the Carolingian Empire, circa 850 AD. As royal architects, players compete to impress their King and maintain their noble status by constructing various landmarks throughout his newly appointed domain. Players will need to collect raw materials, hire apprentices and keep a watchful eye on their workforce. These are treacherous times. Rival architects will stop at nothing to slow your progress. Will you remain virtuous, or be found in the company of thieves and black marketeers? 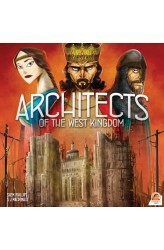 The aim of Architects of the West Kingdom is to be the player with the most Victory Points (VP) at the game’s end. Points are gained by constructing various Buildings and advancing work on the Archbishop’s Cathedral. 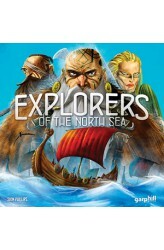 Throughout the game, players w..
Explorers of the North Sea is set in the latter years of the Viking Age. As ambitious sea captains, players seek out new lands to settle and control. They will need to transport their crew among the newly discovered islands to capture livestock, construct outposts and fulfill various other goals. So ready the longships, there are new horizons to explore! Gameplay Overview Each player starts with 7 Vikings and a Longboat on a shared, central Island. From there players will place tiles and begin to venture out to the newly discovered Islands. Proceeding clockwise from the starting player, each player takes their turn in full. On their turn, players first place 1 of their 3 tiles, expanding the game board. They can then take up to 4 actions (any number of the following): .. 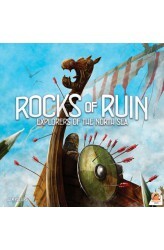 In Explorers of the North Sea: Rocks of Ruin, new opportunities await daring captains. Recent storms have left longships torn apart, with their precious cargo scattered across the rocky shores. Meanwhile, rumors of great fortresses in nearby regions are beginning to spread. Will you be the first to salvage the wrecks, or will you throw caution to the wind and charge the enemy fortresses for fame and glory? In addition to including components for an extra player, Rocks of Ruin also includes three new building types, 24 tiles, five large player boards, two new captain cards, shipwrecks and fortresses. 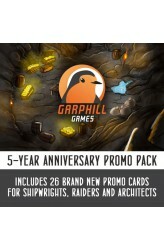 ..
A special set of web-exclusive promo packs for some of Garphill Games' releases from the past 5 years. In this promo pack, you will find 26 never before seen promos for Shipwrights, Raiders and Architects, plus the long-awaited replacement cards of the Merchant and Trader for Raiders of the North Sea. The fully contents are: 9 New Townsfolk Cards for Shipwrights 3 New Hero Cards for Raiders 4 Replacement Cards for Raiders 3 Byzantine Outsider Cards for Raiders 3 Saracen Outsider Cards for Raiders 5 New Apprentice Cards for Architects 3 New Viking Building Cards for Architects ..
We were light years from our home, galaxies away, when we first discovered this ancient celestial body — a planet filled with intriguing, intelligent lifeforms, not too unlike our own. Some built kingdoms below the surface of the green seas, while others controlled the desert-filled plains and cliffs. Among them we found scientists, inventors, farmers, traders and fighters. While our presence has been unsettling for some, we have had very few incidents with the locals. 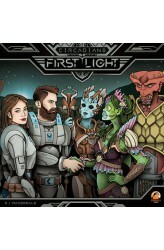 Still, we Circadians, Earth's famed explorers, must do what we can to ensure peace. We must respect this world and its hosts. The heads of Moontide passed down orders from above. We are to open negotiations with the three clans, in hopes of gaining their favor, along with our own security while on the planet. We must also..
Dit is de kickstarter deluxe versie met promokaarten en metal coins! 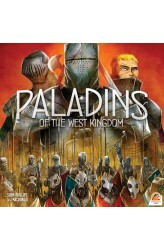 Paladins of the West Kingdom is set at a turbulent time of West Francia's story, circa 900 AD. Despite recent efforts to develop the city, outlying townships are still under threat from outsiders. Saracens scout the borders, while Vikings plunder wealth and livestock. Even the Byzantines from the east have shown their darker side. As noble men and women, players must gather workers from the city to defend against enemies, build fortifications and spread faith throughout the land. Fortunately you are not alone. In his great wisdom, the King has sent his finest knights to help aid in our efforts. So ready the horses and sharpen the swords. The Paladins are approaching. The aim of Paladins of the West Ki..
Dit is de kickstarter versie met promokaarten maar zonder de coins! Paladins of the West Kingdom is set at a turbulent time of West Francia's story, circa 900 AD. Despite recent efforts to develop the city, outlying townships are still under threat from outsiders. Saracens scout the borders, while Vikings plunder wealth and livestock. Even the Byzantines from the east have shown their darker side. As noble men and women, players must gather workers from the city to defend against enemies, build fortifications and spread faith throughout the land. Fortunately you are not alone. In his great wisdom, the King has sent his finest knights to help aid in our efforts. So ready the horses and sharpen the swords. The Paladins are approaching. The aim of Paladins of the West Kin.. 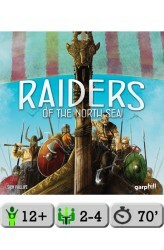 Raiders of the North Sea is set in the central years of the Viking Age. As Viking warriors, players seek to impress the Chieftain by raiding unsuspecting settlements. Players will need to assemble a crew, collect provisions and journey north to plunder gold, iron and livestock. There is glory to be found in battle, even at the hands of the Valkyrie. So gather your warriors, it’s raiding season! Aim of the Game The aim of Raiders of the North Sea is to impress the Chieftain by having the most Victory Points (VP) at the game’s end. Victory Points are gained primarily by raiding Settlements, taking Plunder and making Offerings to the Chieftain. How players use their Plunder is also vital to their success. The game ends when either only 1 Fortress raid remains, all Valkyr..
Collector's Box for storing Raiders of the North Sea, Fields of Fame, Hall of Heroes and all promo items. 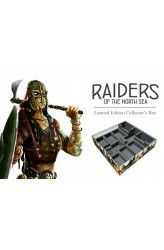 This Collector's Box is a larger box (classic Ticket to Ride / Village / Endeavor size) and comes with a custom plastic insert, designed to hold all components from Raiders of the North Sea + both expansions. The insert also allows space for sleeved cards. 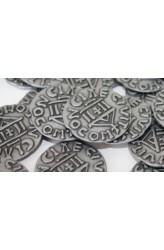 Also included in the box are 40 Wooden Provision Tokens, which can replace the original cardboard tokens from Raiders of the North Sea. .. 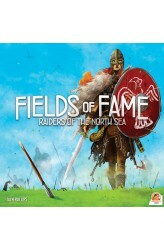 In Raiders of the North Sea: Fields of Fame, enemy jarls have joined forces to help defend against the onslaught of raids on their settlements. But despite their threats, there is fame awaiting those who seek to kill or subdue them. Encountering a jarl is sure to bring injury, but now is no time for the faint-hearted. Onwards to the battlefield! In addition to including components for an extra player, Fields of Fame also includes the new township board, enemy jarl tokens and cards, fame, damage and a variety of new townsfolk. Part I: Gameplay Talkthrough https://www.youtube.com/watch?v=atMpXcXh0SA Part II: Hall of Heroes Talkthrough https://www.youtube.com/watch?v=dOr0Puz8d7g .. 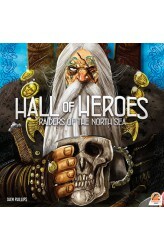 In Raiders of the North Sea: Hall of Heroes, a mead hall has been constructed, attracting a new breed of adventurers. Each raid brings new quests for the daring to endure. But with mead in abundance, there is little room for the wary. So sharpen your axe and ready your shield, there are new adventures awaiting! In additional to including components for an extra player, Hall of Heroes also includes the new mead hall board, large player boards, mead, quests, reputation and a variety of new townsfolk. Part I: Gameplay Talkthrough https://www.youtube.com/watch?v=atMpXcXh0SA Part II: Hall of Heroes Talkthrough https://www.youtube.com/watch?v=dOr0Puz8d7g ..